My second visit to the Pacific Northwest has me looking forward to going back there again soon. What a cool part of the world! I stayed in the town that the classic 90’s T.V. 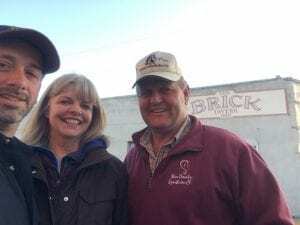 show “Northern Exposure” was filmed. 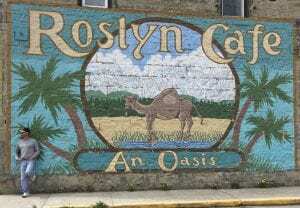 Starting the weekend off with lunch at the Roslyn Cafe (an Oasis) had me charmed pretty quick. It didn’t hurt that the food was amazing! Another fun part of the clinic was the variety of horses and ponies from tall to small. The tallest was a Trakehner, and the smallest were the VSE single and pair, with a Hackney, Fell and Icelandic filling in between along with quite a few Friesians. I love seeing such a variety at a clinic! The clinic location is one of the best places I could think of for this type of event. The Washington State Horse Park is a park that is still in the early days of it’s development, and a good start it is. There’s plenty of stabling on the grounds, plus camper hook-ups, and really nice rings to work in. The park’s staff are meticulous in their efforts grooming the arenas. They even took care to roll the areas we were using to firm up the footing for the carriages. I’m really looking forward to getting out to more of the park next time I’m there. There are 112 acres of trails and fields to explore. We’re going to get to use the derby field for the next clinic, and I’ll definitely set some time aside to drive some more of the grounds. I wouldn’t mind having that place nearby one bit! While we didn’t establish a “theme” for this clinic, one soon surfaced. 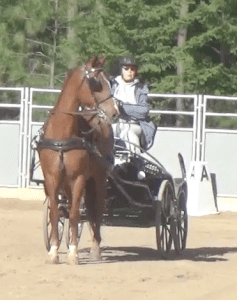 Being early in the season, many of the drivers hadn’t had much opportunity to work their horses before the clinic. That meant that many of the horses were just starting their season out. This gave the clinic a strong slant toward working on the fundamentals. 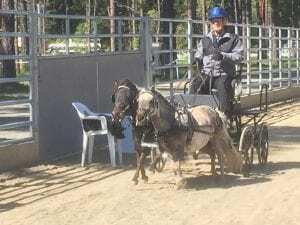 Fundamental training is always time well spent no matter what level of training a horse or driver has. The core concepts of balance, engagement, submission and communication benefit every horse, and every driver. Just about all of the drivers started with the Training Dial to warm up. That gave us a great starting point with a bunch of transitions and work along the rail in each direction of the ring. Then we moved on to specifics for the driver or the horse as I saw they needed. The weather cool and blustery with lots of sunshine every day. The wind made things a little challenging. Teaching long days takes a lot of energy. Teaching long days while leaning into 20+ mph gusts takes even more energy. Fortunately, I had a great group of students to teach. The really cool thing about having good students is that they actually feed my energy level. Just as I think I’m going to have a seat to conserve energy and relieve stress on my leg, I start teaching, get excited about what I’m teaching, and I’m up and out of the chair bouncing on and off carriages again. By the end of the weekend, I was pretty crispy from the sun and wind. Everyone seemed really happy with the clinic. They not only gained new skills but had something to bring home to work on before the next clinic. About ¾ of the participants signed up for the next clinic coming up in June. For the June clinic, we’re going to work on the format a little to see if we can squeeze even more learning out of the weekend. We’re kicking around some fun ideas now that I know the lay of the land there. We’ll incorporate some classes such as a rein board and whip handling class so that auditors get to have a more interactive experience. We’ll probably do a cones clinic, and maybe some more focused sessions with the drivers to build on what they learned at this clinic. I think the June date is shaping up to be a great clinic! It’s only a month away, so if you’re in the Pacific Northwest, get yourself signed up to drive or audit right away! 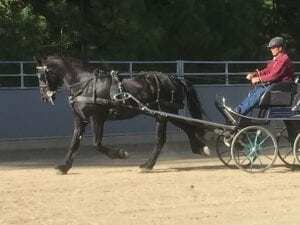 I enjoyed the clinic with Andy at the Washington Horse Park very much. A reminder that going back to basics and keeping focus clarifies communication between horse and driver. I’m really looking forward to the next installment in June. Thanks for your focus and attention. I appreciate all of the opportunities to “feel” new techniques, and then practice and refine them. I also am repeating “there’s no place like home” like a mantra during my drives :-). Cant wait to continue in June with my pony this time.